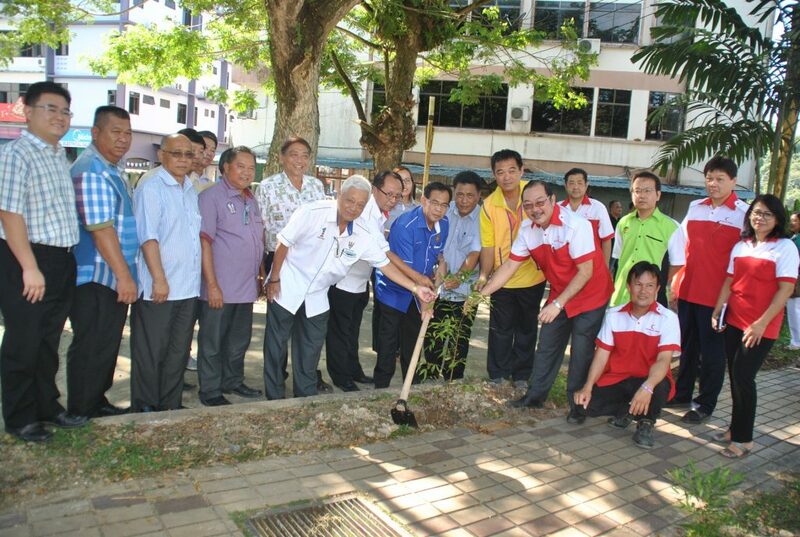 Bukit Goram Assemblyman, Jefferson Jamit Unyat Jamit (holding a hoe) planting a tree to launch the Go Green Campaign jointly organised by Kapit District Council, Lions Club Kapit and MRC Kapit Chapter, recently. KAPIT: Kapit District Council (KDC) in collaboration with two other local bodies namely the Malaysian Red Crescent Kapit Chapter (MRC Kapit) and Lions Club of Kapit jointly embarked on a ‘Go Green Campaign’ to plant 100 trees along Jalan Penghulu Nyanggau from the roundabout at Jalan Selirik to the roundabout at the new bazaar Kapit last Thursday afternoon. Officiating at the campaign was Bukit Goram Assemblyman, Jefferson Jamit Unyat who led the three-planting. Kapit District Council was represented by its Assistant Secretary, Kelimbik Sibat, MRCK Kapit Chapter was represented by its chairman Dr Sia Tih Kwong and Lions Club of Kapit was represented by its president, Ong Hwang Seng. Among those present were Sarawak Administrative Officer for Bukit Mabong, Grace, Pemanca Yong Thu Fook, Penghulu Pasang Tubak, Penghulu Sia Shui Poh, Kapitan Yiap and Kong Cheak Hie, councillors Liew Hui Hua and George Tang, chairmen of the various non-governmental organisations and council staffers. According to the organising chairman, Dr Sia Tih Kwong about 100 seedlings of various types of decorative plants including flowers and palm trees were jointly bought by MRC and the Lions Club of Kapit to create a green environment as an awareness campaign on global warming which has many negative effects on human beings and crops. “One of the obvious phenomenon is the rising of sea water level and the prolong drought and excessive rainfall in certain parts of the world causing a drop in crop production and mankind to suffer. “It is our hope that through this ‘Go Green’ campaign we will be able to create awareness on the importance of protecting our environment for the future generations. One of the contributing factors for the climate change is the uncontrolled felling of trees and clearing of the forest that adversely affect our ecology and rising of global temperature. Tree planting in the town is not only to beautify the landscape but also to provide shade for pedestrians,” Dr Sia said. 100 trees planted at Go Green Campaign 0 out of 5 based on 0 ratings. 0 user reviews.